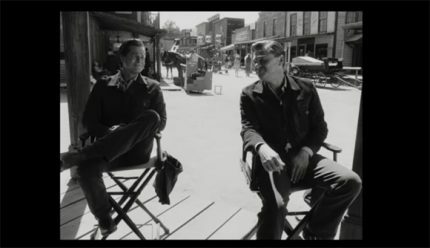 Quentin Tarantino’s cult-like following has been waiting with bated breath to get a taste of his upcoming ninth film, Once Upon a Time in Hollywood, ever since it was announced. Now, the veil has finally been lifted — and it’s safe to say the film will be quite the fun ride… despite the fact that it centers around the brutal, real life murder of Hollywood actress Sharon Tate! 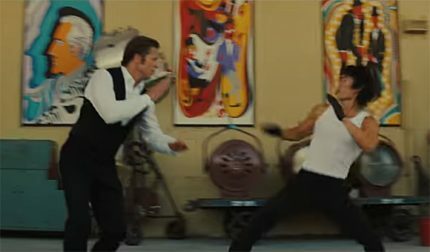 While we get some good glimpses of Margot Robbie as the doe-eyed starlet, the first teaser trailer mostly showcases the hotly-anticipated pairing of Leonardo DiCaprio and Brad Pitt, who respectively play former western TV star, Rick Dalton, and his longtime stunt double, Cliff Booth. Video: Margot Is Back As Harley Quinn In ‘Birds Of Prey’ Teaser! But Rick’s career is winding down when we meet him in the film. It’s 1969 and audiences have grown tired of the western TV series that made DiCaprio’s character famous. Now, struggling to survive in a changing industry, Rick finds himself captivated by an intriguing next door neighbor — who, little does he (or she) know, is doomed to be Charles Manson’s “family”‘s most famous victim. 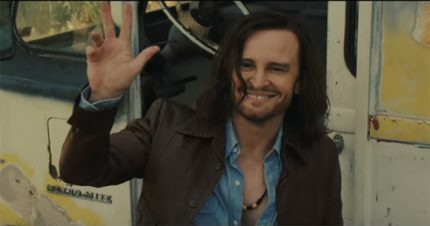 The film’s morbid plot is only winked at in this first teaser… in the form of a creepy shot of a grinning Damon Herriman as the notorious cult leader. But, again, this film isn’t *really* about Manson. It’s about DiCaprio and Pitt doing Hollywood things! Rick’s narcissistic nature is clear by the time we see him get choked up when a young girl says his acting was the best she’s ever seen. Cliff, meanwhile, proves his stuntman capabilities by getting into a backlot fight with Bruce Lee. Perfectly set to the Los Bravos upbeat song Bring a Little Lovin’, the trailer promises a funky thrill ride of showbiz shenanigans and funny dialogue. It makes the actual dark nature of this story all the more disturbing! Tarantino has put together a star-studded cast for his ninth, and possibly penultimate, film. The cast also includes Al Pacino, Bruce Dern (subbing in for the late Burt Reynolds), Dakota Fanning, Timothy Olyphant, Emile Hirsch, Damian Lewis, Michael Madsen, Lena Dunham, Kurt Russell, and the late Luke Perry. Ch-ch-check out the first teaser (above) and catch Once Upon a Time in Hollywood in theaters July 26.